This novel is memorable and fast-paced. I was never bored while reading. Lucy Wrenn’s boyfriend breaks her heart on the first day of her sophomore year of high school. Later, crying in the bathroom, a mysterious senior girl approaches her and invites her to a party later that night. There, the senior and her two friends invite her to join their magical society of heartbreakers. Hoping to learn how to win back her boyfriend’s heart, Lucy accepts their invitation and begins the exhilarating adventure of becoming a heartbreaker. Though enjoying her transformation, Lucy does struggle with a moral issue. To save her heart and complete the process of becoming a heartbreaker, she will have to break someone’s heart. Lucy Wrenn is sweet and easy to relate to. Any girl can imagine themselves as Lucy, desiring love and approval. Following her through her transformations is fun and exciting. Lucy’s realizations become the reader’s realizations. Weingarten created a memorable, likable character that can be admired by a teenage girl. 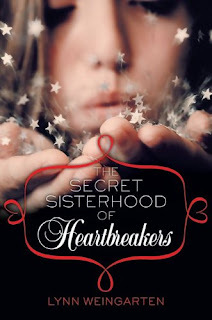 High school girls will love and benefit from The Secret Sisterhood of Heartbreakers. The author wrote this book to be an easy read. The language is clear and enjoyable. A reader does not need a degree in literature or a dictionary to understand Weingarten’s book. This book earns five out of five stars. I read it in a day because I could not put it down. This is a book worthy of an all-night reading session.